Canadian policy related to colonialism has created substantial challenges for First Nations, Métis and Inuit (FNMI) youth and has had a negative influence on their health and well-being. sport-for-development (SfD) programmes are beginning to show positive impacts for children and youth internationally. This approach may also be beneficial for FNMI youth in Canada. This research evaluates the implementation of a SfD programme designed to enhance leadership skills for FNMI youth. A qualitative approach that examines contextual and implementation issues was used. Data were collected using semi-structured interviews and analyzed using thematic analysis. Findings were organized into themes related to strategies for success and challenges. The strategies for success are broken down into the following six themes: 1) designing youth engagement strategies, 2) being creative and adaptable, 3) being a positive presence, 4) applying experiential learning techniques, 5) balancing the integration of culture with youth voice and 6) identifying partnerships and developing relationships with the community. The three themes relating to challenges were 1) community diversity, 2) social issues and 3) staff burnout. Recommendations are provided for issues related to programming and evaluation. In Canada, the First Nations, Métis and Inuit (FNMI) population is growing faster than the general population and is substantially younger with 28% being age 14 and under.1 As such, they represent an important investment for the future of Canada. Despite this population growth, FNMI youth continue to be exposed to more social issues than their Canadian peers such as domestic violence2 and maltreatment,3 which are issues that can have negative impacts on their psychological and physical health.4-6For example, in a young Inuit population in Quebec, researchers found that over 45% of survey respondents reported having had suicidal thoughts.7 Although there is a lack of research examining health indicators of Métis youth,8 Kumar found that 19.6% of Metis between the ages of 26 and 59 had experienced thoughts of suicide in their lifetime.9 There is general agreement that these risk factors are the result of trauma created by historical colonial practices.6,10,11 As such, it is important to understand the contextual influences that can affect programming designed to improve outcomes for FNMI youth. This article presents a programme evaluation that examines the implementation of a sport-for-development (SfD) programme designed to enhance leadership skills for FNMI youth in Canada. SfD initiatives are designed to use sport to attract participants for the purposes of promoting development outcomes such as public health and education.20 Coalter uses the term ‘sport plus’ and ‘plus sport’ to describe two contrasting approaches to SfD.21 ‘Sport plus’ refers to initiatives that use the sport context to promote sport along with other community development outcomes. ‘Plus sport’ approaches use sport to attract participants, but then the main programming is not sport-based. In this context, sport is used as an incentive to create engagement with the targeted population to improve recruitment and retention.22 SfD appears to be a promising approach with vulnerable youth around the globe,23-25 and thus may be useful to apply to FNMI communities. For example, researchers identified that sport participation in a South African township led to the development of youth competencies including improved self-concept, discipline, group skills and respect for others.26 In India, Kay found that a sports-based intervention designed to promote civic activism and leadership in adolescent women helped participants to gain knowledge and become more empowered.24 In research with Aboriginal and Torres Strait Islander youth in Australia, Thomson, Darcy and Pearce conducted several case studies of sport programming designed to reduce social inequities that exist between the indigenous population and other Australians.27 Their findings highlighted the importance of including Aboriginal representatives within program governance, developing community partnerships, empowering the community to promote sustainability and the incorporation of mutually beneficial processes. The Hokowhitu Program is an example of a sports-based positive youth development program targeted at Maori youth.28 It was adapted from the Sports United to Promote Education and Recreation program29and applies a Maori learning method and other cultural concepts. The program was successful in generating positive attitudes toward school, improved coping skills and more optimistic outlooks in the participants. Right to Play (RTP) is a prominent organization within the SfD movement. It originated in 1994 as Olympic Aid, a fundraising initiative that was developed by the Lillehammer Olympic Organizing Committee. RTP’s strategy was to involve Olympic athletes as ambassadors in fundraising efforts in order to support communities in countries experiencing hardship or conflict. Olympic Aid then became RTP when it was incorporated late in the year 2000, which is when RTP began to independently implement programmes. The majority of programmes implemented by RTP throughout the world would fall under the ‘plus sport’ approach. Although the majority of programs implemented by RTP have been in developing countries, in 2010, RTP began operations of the Promoting Life-skills in Aboriginal Youth (PLAY) programme in two FNMI communities in northern Ontario, Canada. Within PLAY, there are a number of initiatives including the Sport for Development Program, the After-School program, the Play for Diabetes Prevention Program and the Youth Leadership Program (YLP). Each community that chooses to partner with RTP within the PLAY programme must choose one or more of these components. The focus of this research is the YLP programme which has recently expanded from two to over 88 FNMI communities across Ontario, Manitoba, British Columbia and Alberta. 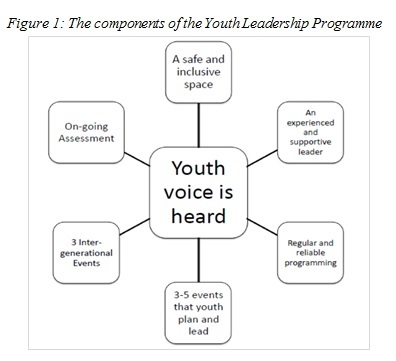 There are seven major components to the YLP (see Figure 1). The first component is youth voice. This component is central to the philosophy of the program. It involves the creation of opportunities for youth to express themselves and to share their vision with others. The second component is the establishment of a safe and inclusive space. This refers to the creation of an environment that is physically and emotionally safe, as well as open to a diversity of participants. This allows the participants to feel welcome and comfortable to share in the programming. The third component involves the incorporation of regular and reliable programming. This component is important for the development of trust and the progression of learning within the programme. This is facilitated through the maintenance of weekly programming at a consistent location. The fourth component involves on-going assessment. This ensures the regular incorporation of participant and community perspectives for quality improvement. The fifth component involves the implementation of three to five community events. In this venture, youth are involved in organizing, coordinating and evaluating a community event. These initiatives allow the youth to learn by doing within a structured environment. It also engages the community and provides the youth with opportunities to develop leadership skills and confidence in their abilities. The sixth component is the requirement of three inter-generational events. This entails the implementation of three more inclusive events that involve family and other community members. The last component involves the inclusion of an experienced and supportive worker, the Community Mentor (CM). It should be recognized that although this programme is implemented by a SfD organization, the YLP does not explicitly include sport within its design. Many of the communities relied on sport activities heavily to draw youth to the programme, while others incorporated more traditional activities to engage youth depending on local youth interests. For example, some programmes would include a basketball pick-up game as a regular element of their weekly programme. Others might not implement a sport on a weekly basis but might organize a hunting trip as one of their community events. The CM’s are the frontline staff and are responsible for delivering the YLP program, building partnerships within the community and for administering the duties associated with the program. Most CMs are community members of FNMI decent with a background in child and youth work or recreation. These individuals are trained bi-annually by RTP. Since the majority of CMs are from the community where they work, they are often already familiar with the youth within the community and hence with those that participate in the programme. In addition, each CM is supported by a Supervisor located within his/her own community and a RTP Program Officer that is responsible for several communities and makes regular visits to each programme. In order to address the identified gaps in the SfD literature, Kay recommends the use of qualitative research that better captures individuals’ perspectives, complexities within programming and contextual dynamics related to community and family.24 This research addresses the shortcomings within the field of evaluation in SfD since it uses a qualitative approach that examines both context and implementation. Researchers have suggested that interventions that promote empowerment for FNMI youth may promote a healthy transition from childhood to adulthood through the provision of manageable developmental challenges and opportunities to strengthen cultural identity.50 Although youth leadership has been identified as an important component of effective PYD programs,43,44 researchers have identified that there is a need to better understand the mechanisms and processes that promote positive outcomes within the programming context.51,52 Therefore, the purpose of this paper is to present a formative evaluation of the YLP component of the PLAY programme that examines contextual challenges and strategies for implementation success. The objective of formative evaluation is to examine implementation issues within programs that are in their early stages of implementation in order to apply the findings to improve programming rather than to examine programme outcomes.53 Recognizing that this programme was recently initiated, the goal of this research was to explore contextual issues that affect operations within the YLP to identify what is working well and areas in need of improvement. Furthermore, this research examines the perceptions of community members who are responsible for the implementation of the program. This study is the result of a research partnership that was initially developed between RTP and the University of Ottawa. The project was initiated when RTP approached the University to invite the researchers to implement an independent program evaluation. Since there was no funding from RTP to support this partnership, the researchers sought and received independent research funding from the Social Sciences and Humanities Research Council of Canada, the largest funding source for research in social sciences in Canada. Throughout the research, RTP supported the logistics of data collection and the researchers provided intermittent feedback regarding the findings and provided recommendations for programming. Researchers have recommended the use of research advisory committees in guiding studies with FNMI communities.54 Researchers have also recommended the inclusion of Elders in the design and implementation of these evaluations.55 In FNMI communities, Elders serve as teachers and role models and are considered to be significant community members because of “their symbolic connection to the past, and for their knowledge of traditional ways, teachings, stories and ceremonies.”56 In order to support the research partnership, a research advisory committee was created that included representatives from RTP, researchers at the University of Ottawa, Elders and external indigenous researchers. The purpose of the committee was to improve the relevance of the research designs and to ensure that community needs were addressed in the process. There were four ethical principles created to guide this study: 1) relational accountability, 2) respectful representation, 3) reciprocal appropriation, and 4) rights and regulations. The principle of relational accountability acknowledges that the researchers must be responsible for maintaining transparent and respectful relationships with everyone involved in the research. Respectful representation involves a commitment to understanding community perspectives and engaging them in knowledge production. Reciprocal appropriation speaks to the importance of ensuring that mutually beneficial outcomes are achieved through the research. The principle of rights and regulations states that the communities must maintain ownership and control of the data. This research has also been reviewed and approved by the University of Ottawa Research Ethics Board. The lead researcher attended five Community Mentor Trainings and one Youth Symposium to recruit participants and conduct interviews. Interviews were conducted with 11 CMs and one Elder. Five of the participants were female and five of them had been involved with the programme for more than one year. The participants worked in 14 different communities from across Ontario (one individual worked in three different communities and another worked in two communities). Four of the communities were designated as Southern, six as Northern, three as fly-in and one was unknown. Each Community Mentor Training was attended by an Elder, and he was interviewed during one of the trainings. Interview participants are identified by codes (Community Mentor = CM, Elder = E). As described above, the data for this research were collected at the trainings and symposiums with a broad cross-section of CMs. In these circumstances, there was no individual community that was involved in the research. For non-geographically based evaluation, researchers have suggested that it is important to recognize service organizations as a community of interest.62,63 In this case, our “community” was the collective of CMs who had their own shared perspectives, values and experiences that brought them together. The qualitative method used in this study was semi-structured interviews. Qualitative interviews are useful in this context because they are a method to capture individual perceptions of the programme, including their experience and understanding.46 Furthermore, story-telling is valued as a traditional FNMI method of sharing knowledge.64-66 LaFrance and Nichols suggest that it is important to tell the program’s story when doing evaluation within indigenous communities and they include story-telling in their Indigenous Evaluation Framework as an essential element.55-57 In line with this tradition, qualitative semi-structured interviews have the capacity to capture stories and detail-rich information. An interview guide was developed and included questions regarding the overall programme context and structure (e.g. please describe the youth you are working with), perceptions of success during implementation (e.g. what was your greatest success? ), challenges experienced during implementation (e.g. did you experience any difficulties implementing the programme?) and community involvement (e.g. are there any other people/partners/organizations who should be involved in the future who could make the programme better? Who?). In order to make sense of the data, a thematic analysis was used.67 This process involved six phases that include: 1) familiarization with the data, 2) generating initial codes, 3) searching for themes, 4) reviewing themes, 5) defining and naming and 6) producing the report. During the familiarization phase, the researcher read and re-read the transcripts and observation notes in order to have a relatively clear idea of the data set as a whole. During this stage, notes and highlights were made in order to keep track of initial impressions and ideas. Initial codes were created using QSR NVivo. Through an iterative process, codes were organized into larger themes based on inter-related meaning and the themes revised and re-organized based on reflection and review. To enhance methodological rigour, analyses were reviewed by the University of Ottawa research team. Furthermore, the researcher presented the initial analyses to CMs in order to obtain their feedback regarding whether the results were capturing their experience accurately. Themes were revised and refined based on the feedback received. Many researchers have argued against the rigid application of fixed criteria in judging qualitative research methods.68,69 Sparkes and Smith recommend the use of flexible lists in order to judge the value of qualitative research.70 This strategy allows researchers to identify criteria of quality during the research process, and as such, these criteria “act as a starting point for judging a certain kind of inquiry, but these may not apply on all occasions and other criteria can be added to or subtracted from them depending on the circumstances.”68 Tracy’s eight ”Big-Tent” model represents a universal set of criteria that can be applied to complement the research context.69 The model also distinguishes between indicators of quality and best practices. Applying this relativist perspective, our research demonstrates several strengths highlighted within this model, including credibility, significant contribution and topic worthiness. Credibility is demonstrated through thick description. The elaborate narratives provided by the CMs provide a comprehensive description of their experiences and the programming environment. Credibility is also reinforced through the member reflections provided by participants regarding their perceptions of the initial analyses and feedback regarding effective knowledge exchange and utilization opportunities. Evaluation research is uniquely situated to provide a significant contribution. The process of evaluation allows the close examination of contextual issues and the ability to provide concrete and practical recommendations both for the programme under study, as well as for related interventions and initiatives. The criterion of topic worthiness is fulfilled since the subject of this research is of such considerable importance. Given the issues that face FNMI youth today, including elevated rates of suicide in many communities,17 exposure to violence against women,2,71 and criminal involvement,72,73 it is critical to examine the best ways to alleviate these disparities. Recognizing that community empowerment has a considerable relationship with youth suicide17 and that these issues require community-driven solutions,74 it is of crucial importance to examine community-based leadership programming to identify what works and what is in need of improvement in order to share lessons learned to support program and policy development. The analysis resulted in the development of two overarching themes. The first relates to strategies used to implement the programme that were perceived as being successful and the second related to challenges experienced in implementing the programme. Within these two overarching themes a number of sub-themes arose which are described in more detail below. The CMs talked at length about the different strategies that they believed helped them to have a successful programme that the youth enjoyed and to overcome barriers. Success was subjectively defined by the CMs and based on their understanding of the context and what they perceived as contributing to an effective and efficient programme. Some of these strategies included creating individual strategies for empowerment, identifying new contextually adaptive activities, integrating their community culture and making local connections to enhance the programme. The strategies are broken down into the following six themes: 1) designing youth empowerment strategies, 2) being creative and adaptable, 3) being a positive presence, 4) applying experiential learning techniques, 5) balancing the integration of culture with youth voice and 6) identifying partnerships and developing relationships with the community. The core philosophy of this programme is leadership and the development of independence among youth and their communities. Many of the CMs endorsed this approach and developed their own methods to promote youth empowerment. One CM talked about how the youth develop confidence through the skills that they learn and by taking ownership for the program. The Elder also discussed the importance of the programme being youth-led, rather than based on standardized best practices from abroad. Similarly, another CM emphasized the importance of really being there for the youth and supporting them. The Elder who was involved with the programme also emphasized the importance of being open-minded and compassionate with the youth in order to learn from them. One way that CMs made the programme more appealing to youth was through finding activities that provided education without creating a classroom environment. The CMs felt that many of the youth did not feel comfortable or would lose interest in typical educational activities. As a result the CMs talked about how a lot of the lessons were intermingled with other activities or provided within applied or experiential contexts without using traditional learning resources. There was a range of different challenges that were perceived to have affected the implementation of the programme, but there were several that were more salient and widespread among the different communities. The three themes that emerged under challenges were community diversity, social issues and staff burn-out. These differences in infrastructure created a barrier for some programmes in terms of finding a consistent venue for sports and other activities. This forced some CMs to run their programming out of fire station garages and public health building basements, while others had a full community centre available with a gym and youth room equipped with state-of the-art audio-visual equipment. For some CMs, the scarcity of venues within their community created logistical problems when they were trying to run activities. Another challenge for program implementation concerned social issues that can affect FNMI communities; these are the problems that have been linked to colonial policy and practice, including domestic violence and family breakdown, widespread addictions, lateral violence and behavioural issues. This paper describes an evaluation of contextual issues associated with the implementation of a SfD leadership programme across diverse FNMI communities. A number of successful strategies that the staff employed in order to improve programme implementation were identified. These strategies were related to adapting the programme to meet participant, community and contextual needs. However, a number of challenges encountered while implementing the programme were also noted. Below is a discussion of the results of this study in regards to previous research as well as recommendations for both researchers and practitioners working in the SfD field. Finally, being a positive presence for youth was identified as an important way to help youth to get engaged in the program. There are numerous studies in PYD programming that have identified having a caring adult as a fundamental program component.43,52,84-88 This approach would be particularly important when dealing with youth who may be coping with mental health issues and might be exhibiting negative behaviours or experience anxiety in new situations. The CMs emphasized the importance of taking an optimistic, compassionate approach and providing a secure environment that creates the space the youth need to feel safe and welcome. Based on the feedback related to the challenges, there are several recommendations that can be made. Since CMs are feeling overworked and stressed in their roles, it is important for them to receive more support. This can be facilitated through several strategies. Resources can be developed and tailored to provide more targeted and relevant information for each community. For example, success stories for northern communities dealing with cost savings challenges can be compiled and applied to these specific situations when they arise in future. Many FNMI youth are suffering from historical trauma.13,89 As a result, many CMs felt unprepared to help the youth cope with the distress they were experiencing. Identifying community supports who can help the youth in these areas along with offering some introductory training in managing trauma. Technology has been used in very innovative and participatory ways in order to enhance mental health outcomes with youth.90 Since many youth, staff and community members are familiar with and use smart devices and social technology, these tools could be incorporated to facilitate programme operations and improve efficiency. This programme is being implemented across a wide geographic area and this technology could be used to bring CMs together more regularly. It might also be useful to partner CMs who are experiencing similar contexts and challenges. This strategy would be particularly effective for new CMs who could benefit from the knowledge of more experienced CMs. Setting up forums and encouraging regular communication among CMs might help them to feel more supported and to develop informal knowledge as in Communities of Practice. Another way that technology could be used to support CMs in their roles would be to automate some of the administrative work. Targeting and automating monitoring that can be rolled up to programme staff more easily would reduce the workload. For example, one strategy would be to use photos taken during group nights to create a headcount and facilitate attendance monitoring to capture participation rates. Dictation software (which is available on many mobile devices) and online survey software would also make monitoring and evaluation more efficient. There are several recommendations that can be made for other evaluators working to examine youth programming in FNMI communities. Relationship building is a very important step in the research process.63,92 It is a necessary pre-requisite for identifying individuals with in-depth knowledge and experience in the programme. It is also important for adaptations in data collection procedures. For example, interviews can be refined so that the terms and language used are more relevant to the context and orientation of the participant. Ongoing engagement with community members is also essential for having a meaningful understanding of the experiences of those connected with the programme. Since each community was so different, it took time to be able to develop a clear picture of the dynamics within each situation. It is also very important to collaborate with other indigenous leaders.57,92 This research benefitted from the insight and creativity contributed by FNMI leaders, which includes Elders, indigenous researchers both from within and outside of the research team, and indigenous leaders within the RTP organization. These individuals made some of the best contributions to the design, execution and conceptualization of this research. Many of the insights that contributed to the findings were achieved through in-depth discussions and reflection with the Elders and FNMI colleagues. Many of the community connections were also made through the direct support of FNMI leaders within RTP. When working with communities, it is important to look for unique opportunities to contribute through ways such as research capacity-building10 and grant-writing.63 In this setting, the CMs had different needs depending on their situation. Some needed help with grant writing within their fund-raising efforts. Others needed support finding programme materials or exploring outside events that would benefit their programme participants. It is also important to identify the unique needs of the CMs regarding knowledge exchange. Taking the time to discuss and identify the content and format of the findings that would be most useful for them would be a key component in developing an effective partnership for programme evaluation. This formative evaluation was responsive to local needs since it placed a focus on community member perspectives.24 Given that indigenous cultures value the tradition of story-telling as an important method of sharing knowledge,64,65 this research emphasized story-telling through the use of rich narrative descriptions that detail personal experiences within the programme. Finally, this research benefitted from the engagement of an advisory committee composed of Elders, indigenous researchers and indigenous programme staff. They all played a pivotal role in guiding the research development, providing feedback regarding methods and offering insight to improve contextual understanding. This study is limited as it examines programme perceptions rather than direct observations. Future examinations of programme operations would benefit from a more comprehensive description of process issues including information regarding participant exposure, partnership development, community infrastructure and programme activity logs. Developmental evaluation is an approach that is well-suited to complex and changing environments as it allows for innovation in methodology.58 Researchers have identified this is a valuable approach to evaluation within contexts that use youth engagement to guide programming97 as well as within community-based research with FNMI youth.98 This research would have benefited from using a developmental evaluation approach; however, since the evaluators were working externally, there was not as many opportunities to work closely with the communities and to collaborate on a timely basis. Finally, this evaluation was designed with the intention of applying the findings to practice, both within RTP and for other organizations implementing leadership programs for FNMI youth. Reports were provided to the organization on a regular basis and presentations of the findings and recommendations were provided throughout the term of the research. However, as a result of high turnover in leadership as well as difficulties maintaining pace with program operations, the findings were not applied to the extent that was originally intended. In the future, it may be beneficial to implement strategies that focus on capacity-building and that integrate research and evaluation within internal monitoring practices. Consequently, organizational infrastructure and knowledge can be improved, increasing the opportunity for the utilization of findings. This research applied a qualitative approach that highlighted local community member perceptions and examines both programme context and implementation. Results indicated that there are many challenges that must be navigated in order to successfully implement SfD leadership programming for youth within FNMI communities. Recognizing this adversity, frontline staff have developed creative strategies to overcome programming obstacles including making adaptations to the programme, creating community partnerships and supporting youth empowerment. These are important strategies that are applicable within SfD programmes designed to enhance leadership for FNMI youth. If other organizations incorporate these components, they may be able to create a programme that is truly integrated with and led by the community. Lessons learned may also be useful for researchers and evaluators working in these contexts. 1. Turner A, Crompton S, Langlois S. Aboriginal peoples in Canada: First Nations people, Métis and Inuit. National Household Survey; 2011. 2. Sinha M. Measuring violence against women: Statistical trends. Juristat Can Cent Justice Stat. 2013;1. 3. Public Health Agency of Canada (PHAC). Canadian incidence study of reported child abuse and neglect – 2008: Major findings. 2010. 4. Brown J, Higgitt N, Wingert S, Miller C, Morrissette L. Challenges faced by aboriginal youth in the inner city. Can J Urban Res. 2005;14(1):81–106. 5. First Nations Information Governance Centre (FNGIC). First Nations Regional Health Survey (RHS) 2008/10: National report on adults, youth and children living in First Nations communities. 2012. 6. Royal Commission on Aboriginal Peoples. Report of the Royal Commission on Aboriginal Peoples. 1996;(Generic). 7. Fraser SL, Geoffroy D, Chachamovich E, Kirmayer LJ. Changing rates of suicide ideation and attempts among Inuit youth: A gender‐based analysis of risk and Protective Factors. Suicide Life Threat Behav. 2015;45(2):141–56. 8. Ning A, Wilson K. A research review: exploring the health of Canada’s Aboriginal youth. Int J Circumpolar Health. 2012;71. 10. Crooks CV, Chiodo D, Thomas D. Engaging and empowering Aboriginal youth: A toolkit for service providers. 2010;2nd(Generic). 11. Kral MJ. Postcolonial suicide among Inuit in Arctic Canada. Cult Med Psychiatry. 2012;36(2):306–25. 12. Kirmayer LJ, Tait CL, Simpson C. The mental health of aboriginal peoples in Canada: Transformations of identity and community. In: Kirmayer LJ, Valaskis GG, editors. Healing traditions: The mental health of aboriginal peoples in Canada. Vancouver, BC: UBC Press; 2009. p. 3–35. 13. Pearce ME, Christian WM, Patterson K, Norris K, Moniruzzaman A, Craib KJP, et al. The Cedar Project: Historical trauma, sexual abuse and HIV risk among young Aboriginal people who use injection and non-injection drugs in two Canadian cities. Soc Sci Med. 2008;66(11):2185–94. 14. Mosby I. Administering colonial science: Nutrition research and human biomedical experimentation in Aboriginal communities and residential schools, 1942–1952. Hist SocialeSocial Hist. 2013;46(1):145–72. 15. Trocmé N, Knoke D, Blackstock C. Pathways to the overrepresentation of Aboriginal children in Canada’s child welfare system. Soc Serv Rev. 2004;78(4):577–600. 16. Bratu I, Lowe D, Phillips L. The impact of fatal pediatric trauma on aboriginal children. J Pediatr Surg. 2013;48(5):1065–70. 17. Chandler MJ, Lalonde C. Cultural continuity as a hedge against suicide in Canada’s First Nations. Transcult Psychiatry. 1998;35(2):191–219. 18. Jorm AF, Bourchier SJ, Cvetkovski S, Stewart G. Mental health of Indigenous Australians: a review of findings from community surveys. Med J Aust. 2012;196(2):118–21. 19. Cooke M, Mitrou F, Lawrence D, Guimond E, Beavon D. Indigenous well-being in four countries: an application of the UNDP’s human development index to Indigenous peoples in Australia, Canada, New Zealand, and the United States. BMC Int Health Hum Rights. 2007;7(1):1. 20. Kidd B. A new social movement: Sport for development and peace. Sport Soc. 2008;11(4):370–80. 21. Coalter F. A Wider Social Role for Sport: Who’s Keeping the Score? London: Routledge; 2007. 22. Hartmann D, Kwauk C. Sport and development: An overview, critique, and reconstruction. J Sport Soc Issues. 2011;35(3):284–305. 23. Burnett C. The impact of a sport-for-education programme in the South African context of poverty. Sport Soc. 2014;17(6):722–35. 24. Kay T. Developing through sport: evidencing sport impacts on young people. Sport Soc. 2009;12(9):1177–91. 25. Woodcock A, Cronin T, Forde S. Quantitative evidence for the benefits of Moving the Goalposts, a Sport for Development project in rural Kenya. Eval Program Plann. 2012;35(3):370–81. 26. Whitley MA, Hayden LA, Gould D. Growing up in the Kayamandi Township: II. Sport as a setting for the development and transfer of desirable competencies. Int J Sport Exerc Psychol. 2015;1–18. 27. Thomson A, Darcy S, Pearce S. Ganma theory and third-sector sport-development programmes for Aboriginal and Torres Strait Islander youth: Implications for sports management. Sport Manag Rev. 2010;13(4):313–30. 28. Danish S, Forneris T, Hodge K, Heke I. Enhancing youth development through sport. World leisure journal. 2004 Jan 1;46(3):38-49. 29. Danish S. SUPER (Sports United to Promote Education and Recreation) Program (Third Edition): Leader Manual and Student Activity Book. Richmond, VA: Life Skills Center, Virginia Commonwealth University; 2002. 30. Bean C N, Forneris T. Exploring stakeholders’ experiences of implementing an ice hockey programme for Inuit youth. J Sport Dev. in press, 33 pages. 31. Bean C. Program evaluation: Nunavik Youth Hockey Development Program. Ottawa, Canada: University of Ottawa; 2013 Apr. 33. Ritchie SD, Wabano MJ, Russell K, Enosse L, Young NL. Promoting resilience and wellbeing through an outdoor intervention designed for Aboriginal adolescents. Rural Remote Health. 2014;14:2523. 35. Galipeau M, Giles AR. An examination of cross-cultural mentorship in Alberta’s Future Leaders Program. Sport Soc Dev Peace Res Sociol Sport Vol 8 Emerald Group Publ Ltd. 2014;8:147–70. 36. Coalter F. The politics of sport-for-development: Limited focus programmes and broad gauge problems? Int Rev Sociol Sport. 2010;45(3):295–314. 37. Darnell SC. Playing with race: Right to Play and the production of whiteness in “development through sport.” Sport Soc. 2007;10(4):560–79. 38. Donnelly P, Atkinson M, Boyle S, Szto C. Sport for development and peace: A public sociology perspective. Third World Q. 2011;32(3):589–601. 39. Hayhurst L, Giles A. Private and Moral Authority, Self-Determination, and the Domestic Transfer Objective: Foundations for Understanding Sport for Development and Peace in Aboriginal Communities in Canada. Sociol Sport J. 2013;30(4). 40. Kidd B. Cautions, questions and opportunities in sport for development and peace. Third World Q. 2011;32(3):603–9. 41. Lerner RM, Lerner JV, Almerigi JB, Theokas C, Phelps E, Gestsdottir S, et al. Positive youth development, participation in community youth development programs, and community contributions of fifth-grade adolescents findings from the first wave of the 4-H study of positive youth development. J Early Adolesc. 2005;25(1):17–71. 42. Damon W. What Is Positive Youth Development? Ann Am Acad Pol Soc Sci. 2004;591:13–24. 43. Lerner RM, Lerner JV, Almerigi J, Theokas C, Phelps E, Naudeau S, et al. Towards a new vision and vocabulary about adolescence: Theoretical, empirical, and applied bases of a “Positive Youth Development” perspective. In: Child psychology: A handbook of contemporary issues. 2006. p. 445–69. 44. Zeldin S, Camino L. Youth leadership: Linking research and program theory to exemplary practice. New Des Youth Dev. 1999;15(2):10–5. 45. Battiste M. Indigenous knowledge and pedagogy in First Nations education: A literature review with recommendations. Apamuwek Institute Ottawa; 2002. 46. Patton MQ. Qualitative research and evaluation methods. London: Sage; 2002. 47. Plano Clark VL, Badiee M. Research questions in mixed methods research. In: Tashakkori, A, Teddlie, C., editors. Sage handbook of Mixed Methods in Social and Behavioral Research. Thousand Oaks, CA: SAGE; 2010. p. 275–304. 48. Levermore R. Evaluating sport-for-development: Approaches and critical issues. Prog Dev Stud. 2011;11(4):339–53. 49. Hayhurst LM, Giles AR, Radforth WM. “I want to come here to prove them wrong”: using a post-colonial feminist participatory action research (PFPAR) approach to studying sport, gender and development programmes for urban Indigenous young women. Sport Soc. 2015;18(8):952–67. 50. Kirmayer, L., Simpson, C., Cargo, M. Healing traditions: Culture, community and mental health promotion with Canadian aboriginal peoples. Australas Psychiatry. 2003;11(SUPPL. 1):S15–23. 51. Hodge K, Danish S, Martin J. Developing a conceptual framework for life skills interventions. Couns Psychol. 2013;41(8):1125–52. 52. Roth JL, Brooks-Gunn J. Evaluating youth development programs: Progress and promise. Appl Dev Sci. 2015;1–15. 53. Chen H-T. Practical program evaluation: Assessing and improving planning, implementation, and effectiveness. Sage; 2005. 54. Johnston‐Goodstar K. Decolonizing evaluation: The necessity of evaluation advisory groups in indigenous evaluation. New Dir Eval. 2012;2012(136):109–17. 55. LaFrance J, Nichols R. Reframing evaluation: Defining an Indigenous evaluation framework. Can J Program Eval. 2010;23(2):13. 56. Stiegelbauer SM. What is an Elder? What do Elders do? : First Nation Elders as teachers in culture-based urban organizations. Can J Native Stud. 1996;14:37–66. 57. LaFrance J, Nichols R, Kirkhart KE. Culture writes the script: On the centrality of context in indigenous evaluation. New Dir Eval. 2012;2012(135):59–74. 58. Patton MQ. Developmental evaluation: Applying complexity concepts to enhance innovation and us. New York, NY: Guilford Press; 2010. 59. Crotty M. The foundations of social research: Meaning and perspective in the research process. London: Sage Publications; 1998. 60. Sparkes AC, Smith B. Narrative constructionist inquiry. In: Handbook of constructionist research. 2008. p. 295–314. 61. Schwandt TA. Three epistemological stances for qualitative inquiry. In: Handbook of qualitative research. 2000. p. 189–213. 62. CIHR, NSERC, SSHRC. Tri-Council Policy Statement: Ethical Conduct For Research Involving Humans. 2014. 63. McHugh TF, Kowalski KC. Lessons learned: Participatory action research with young aboriginal women. Pimatisiwin J Aborig Indig Community Health. 2009;7(1):117–31. 64. Blodgett AT, Schinke RJ, Smith B, Peltier D, Pheasant C. In Indigenous Words: Exploring Vignettes as a Narrative Strategy for Presenting the Research Voices of Aboriginal Community Members. Qual Inq. 2011;17(6):522–33. 65. Julien M, Wright B, Zinni DM. Stories from the circle: Leadership lessons learned from aboriginal leaders. Leadersh Q. 2010;21(1):114–26. 66. Kovach ME. Indigenous methodologies: Characteristics, conversations, and contexts. University of Toronto Press; 2010. 67. Braun V, Clarke V. Using thematic analysis in psychology. Qual Res Psychol. 2006;3(2):77–101. 68. Sparkes AC, Smith B. Judging the quality of qualitative inquiry: Criteriology and relativism in action. Psychol Sport Exerc. 2009;10(5):491–7. 69. Tracy SJ. Qualitative quality: Eight “big-tent” criteria for excellent qualitative research. Qual Inq. 2010;16(10):837–51. 70. Sparkes AC, Smith B. Qualitative research methods in sport, exercise and health: From process to product. Routledge; 2014. 72. Barker B, Alfred GT, Fleming K, Nguyen P, Wood E, Kerr T, et al. Aboriginal street-involved youth experience elevated risk of incarceration. Public Health. 2015;129(12):1662–8. 74. Kral MJ, Wiebe PK, Nisbet K, Dallas C, Okalik L, Enuaraq N, et al. Canadian Inuit community engagement in suicide prevention. Int J Circumpolar Health. 2009;68(3). 75. Hellison D, Martinek T, Walsh D. Sport and responsible leadership among youth. Holt N, editor. Posit Youth Dev Sport. 2008;49–60. 76. Turner M. Mental wellness through culture: An examination of youth suicide rates in Canada’s Aboriginal communities and recommendations for public policy. Arbutus Rev. 2014;5(1):177–90. 77. Crooks CV, Chiodo D, Thomas D, Hughes R. Strengths-based programming for First Nations youth in schools: Building engagement through healthy relationships and leadership skills. Int J Ment Health Addict. 2010;8(2):160–73. 78. Isogai AD, Gates A, Gates M, Hanning RM, Tsuji LJ. A qualitative evaluation of the efficacy of the delivery of the educational component of a nutrition program, in a remote First Nation community. Pimatisiwin J Aborig Indig Community Health. 2012;9(2). 79. Hart R. Children’s participation: The theory and practice of involving young citizens in community development and environmental care. London: Earthscan; 1997. 80. Flores KS. Youth participatory evaluation: Strategies for engaging young people. San Franscisco, CA: Jossey-Bass; 2008. 81. Pereira N. Ready… Set… Engage: Building Effective Youth/Adult Partnerships for a Stronger Child and Youth Mental Health System. Children’s Mental Health Ontario and The Provincial Centre of Excellence for Child and Youth Mental Health at CHEO; 2007. 82. Agans JP, Geldhof GJ. Trajectories of participation in athletics and positive youth development: The Influence of Sport Type. Appl Dev Sci. 2012;16(3):151–65. 83. Parent A. “ Keep us coming back for more”: Urban aboriginal youth speak about wholistic education. Can J Native Educ. 2011;34(1):28. 86. Bowers EP, Johnson SK, Warren DJ, Tirrell JM, Lerner JV. Youth–Adult Relationships and Positive Youth Development. In: Promoting Positive Youth Development. Springer; 2015. p. 97–120. 88. Petitpas AJ, Cornelius AE, Van Raalte JL, Jones T. A framework for planning youth sport programs that foster psychosocial development. Sport Psychol. 2005;19(1):63–80. 89. Gone JP. Redressing First Nations historical trauma: Theorizing mechanisms for indigenous culture as mental health treatment. Transcult Psychiatry. 2013;50(5):683–706. 91. Wenger EC, Snyder WM. Communities of practice: The organizational frontier. Harv Bus Rev. 2000;78(1):139–46. 92. Robertson P, Jorgensen M, Garrow C. Indigenizing evaluation research: how Lakota methodologies are helping“ raise the tipi” in the Oglala Sioux nation. Am Indian Q. 2004;499–526. 93. Young NL, Wabano MJ, Burke TA, Ritchie SD, Mishibinijima D, Corbiere RG. A process for creating the Aboriginal children’s health and well-being measure (ACHWM). Can J Public Health. 2013;104(2):e136–41. 94. Castleden H, Garvin T, First Nation H -a -a. Modifying Photovoice for community-based participatory Indigenous research. Soc Sci Med. 2008;66(6):1393–405. 95. Poudrier J, Mac-Lean RT. “We’ve fallen into the cracks”: Aboriginal women’s experiences with breast cancer through photovoice. Nurs Inq. 2009;16(4):306–17. 96. Shea JM, Poudrier J, Thomas R, Jeffery B, Kiskotagan L. Reflections from a creative community-based participatory research project exploring health and body image with first nations girls. Int J Qual Methods. 2013;12(1):272–93. 97. Campbell-Patton C, Patton MQ. Conceptualizing and evaluating the complexities of youth civic engagement. In: Sherrod LR, Torney-Purta J, Flanagan CA, editors. Handbook of research on civic engagement in youth. Hoboken, New Jersey: John Wiley & Sons, Inc.; 2010. p. 593–619. 98. Crooks CV, Snowshoe A, Chiodo D, Brunette-Debassige C. Navigating between rigour and community-based research partnerships: Building the evaluation of the Uniting Our Nations Health Promotion Program for FNMI youth. Can J Commun Ment Health. 2013;32(2):13–25.